Mondays are undeniably bad, but perhaps a bit of good free fiction will lessen the pain. • At Enchanted Conversations: "The Goblin Players" by Ross Smeltzer. Fantasy. "A long time—but not so long ago that men still remembered the olden gods—there was a town near here. It is gone now, but you can find its crumbled foundations hidden under orange and brown leaves if you look in the right places. It is a lonely place now, and is rarely visited." • At Mad Scientist Journal: "Data Crabs" by Deborah Walker, Science Fiction. "I reached for my handbag. I looked at Dinah and Pete. They’d be okay without me. The house would run smoothly, the food would arrive, the machines would keep the rooms nice and clean. A thought occurred to me, 'Will there be data streams under the sea?'" • At The WiFiles: "Aces High" by Holly Day. Speculative Fiction. "Holes had been drilled in her arms, strung through with metal threads. Her veins had been drained of blood, the marrow stripped from her bones and replaced with alloy. Her skin had been removed completely. What remained of her organic form had been dipped in metal lighter and more flexible and infinitely stronger than aluminum foil." • At Amazon: The Amazing Morse by James Rozoff. Horror. "When Dave Morse was young, magic meant everything to him. But as he grew up, the magic seemed to slip away from his life. Until a chance encounter with a spiritualist changed all that. Then there was magic again, magic and mystery...and terror. Now Dave is just praying it will end." • At Cast of Wonders: "Episode 128: Robots Don’t Cry" by George Edwards, Read by Pete Milan. YA SciFi. "He regarded me skeptically. 'Space Robot, huh? So you came from space, down to earth, to save a girl?'" • At Cthulhu: "Dreams in the Witch House" Parts One and Two. by H. P. Lovecraft. Horror. "He was in the changeless, legend-haunted city of Arkham, with its clustering gambrel roofs that sway and sag over attics where witches hid from the King’s men in the dark, olden days of the Province. Nor was any spot in that city more steeped in macabre memory than the gable room which harboured him—for it was this house and this room which had likewise harboured old Keziah Mason, whose flight from Salem Gaol at the last no one was ever able to explain." • At Toasted Cake: "Second Chance" by Ken Liu. Science Fiction. 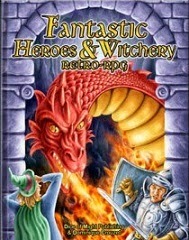 • Fantastic Heroes & Witchery by Dominique Crouzet. A interesting looking, and well illustrated "simulacrum of the well known role-playing game that features fighters, clerics and magic-users prowling mysterious dungeons, and combating dragons to take their treasures. It is not a clone of a particular edition [. . .] but a combination of several editions from “classic” to “3e,” to which were added a lot of options." Tis free version lacks only an index of spells. • At Rended Press: Two lists of links. "Links to All of Paizo's FreeRPG Day Stuff" and "Scavenging Free d20 Material from Paizo.com"
Audio Fiction: At Crime City Central: "Courtesy Call" by Justin Gustainis, read by Summer Brooks. Crime Fiction.